This 57-acre resort and conference center in Myrtle Beach has 8 tennis courts (5 of them Har-Tru) under USPTR/USPTA pro Patrick Paggeot. 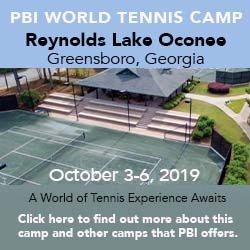 The facility has been the site of the Big South Athletic Conference regional playoffs, United States Tennis Assocation Women’s trials, and annual regional doubles tournaments. Otherwise, the resort itself has an oceanfront beach club, two indoor and six outdoor swimming pools, a kiddie pool, playground, and bike paths. Options are 1-, 2-, and 3-bedroom condos, either in the towers on the beach or inland, and 2- and 3-bedroom homes. See their web site for details. Here's what others have had to say about Ocean Creek Resort.